Körner’s Folly is an extravagant time capsule into Victorian life, where new secrets are uncovered each visit whether it’s your first or your tenth. 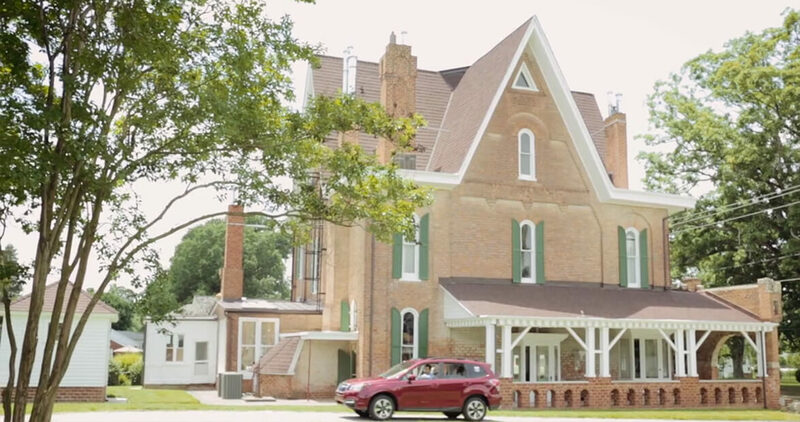 When people drive down Main Street in Kernersville and pass Körner’s Folly for the first time, their eyes will often drift off the road for a moment as they try to process what they’ve just seen. What is that place? Odd might be an understatement — the profile of the roof is reminiscent of a witch’s hat. No two windows are exactly alike. Six chimneys protrude out of the roof. The exterior is composed of eight different sizes of bricks. It’s as if the building was pulled from a Grimms’ Fairy Tales story and plopped in the middle of town. This persists as guests walk across the tiled porch and inquisitively open the front door, feeling an anticipation children feel listening to a fairy tale for the first time. Descriptions like odd, peculiar, and eerie, once said upon entering the building, have been replaced with new phrases (and praises). “Beautiful and mysterious,” “So awesome,” “Loved it immensely”, and “Truly like no other house I’ve seen” are found written in the guestbook on the way out. Inside, guests can explore the original Victorian-style furniture, trinkets, and architecture of the 22 rooms spread over seven levels and three stories. Unlike a fairy tale, there’s no need to close your eyes to transport yourself to another world and time at Körner’s Folly. Jule Gilmer Körner, designer and owner of the home, began construction on Körner’s Folly in 1878 and opened it to the public on Easter Monday in 1880. The home’s original purpose was to serve as a showroom for his furniture and interior decorator designs. This was unheard of at the time; most Kernersville residents purchased furniture and home décor from print catalogs and advertisements. But Körner, an innovator, had little regard for the “standard” way of doing things. Before venturing into the interior design business with his company “Reuben Rink Decorating and House Furnishing Company”, Körner worked with the tobacco tycoons his time as a mural painter for Blackwell Tobacco Company. This resulted in many of his interior design connections and customers had money to spend, and often had an affinity for the lavish and grand. Walking through the house today, visitors can wind through the narrow hallways and explore the home as clients would have more than 100 years ago. No two rooms are alike; in the reception room, visitors are always floored by its size and beauty. Make sure to duck your head in the children’s playrooms — the ceilings are only five-and-a-half feet tall. Did you feel an unsettling change in temperature when you stepped down into the cellar? Don’t worry, it’s not ominous; the room was purposefully designed partially into the ground to act as a cooler for food (though now might be a good time to bring up that several paranormal investigators have deemed the house haunted… but it’s a good energy!). The attic is home to Cupid’s Park Theater, its ceiling aptly covered in cupid-themed murals, and was potentially the first “little theater” in America where local children could come to learn performing arts and etiquette taught by Polly Alice, Körner’s wife. One of the most impressive features of Körner’s Folly is that 90 percent of the luxurious furnishings and details in the house today are original to the time, which makes it unique in comparison to other house museums. But Pennington says there’s a simple reason for this: In making grand items to complement the house as a showroom, Körner often made items a little too over the top — literally. “The majority of the furniture in the house was literally built in the room where it stands,” Pennington says. “I don’t think we could move it if we wanted to.” Items like the floor-to-ceiling buffet in the dining room were not only a marvel; they were a mainstay. Designing and furnishing the upper levels also presented unique challenges due to the non-uniform layouts of different rooms and the small hallways. The grand piano, brought into the attic for Cupid’s Park Theater, had to be literally lifted through the floors to its final resting spot, where it still stands today. “[The piano] could not be brought up any stairs, so [Körner] had to cut trap doors through the floors beneath it to get it up here,” Polly Alice penned in a collection of writings compiled and published by her children after her death. Today, all 22 rooms of the home are open for visitors to take self-guided tours and marvel at the design of the house and the meticulous attention to detail given to every element of the building. Now that the home, listed on the National Register of Historic Places, has been opened to the public again, the Körner’s Folly Foundation’s main priorities are restoration and interpretation — specifically how the home appeals to different demographics. The home regularly hosts puppet shows in the little theater for children, community events and fundraisers on its lawn, and is most popular during the Christmas season, when each room is extravagantly decorated for a full Victorian Christmas celebration. With the growing number of foot traffic in Körner’s Folly, restoration efforts are critical to the home’s success. From 2012 to 2015, updates were made to the exterior of the home, specifically stabilizing the foundation and restoring the porch, roof, and chimneys. The focus has now shifted to the interior house, which is worked on at a room-by-room basis and can cost anywhere from $5,000 to a quarter of a million dollars to restore the rooms to their 1900-1905 appearance. The foundation uses photos, like the ones found in the rooms, from the turn of the 20th century to generate a base knowledge of what the rooms looked like during the home’s heyday. Further studies and tests often reveal fun secrets about the house, like former wall paint colors, hidden murals, or even century-old signatures written on the walls that surprise even the most well-versed Körner’s Folly historian. “I feel like there’s always more, new things to uncover in the house,” Pennington says. It’s quite likely that there is not a single article, photo, or video can fully capture the experience of touring Körner’s Folly. Not because people haven’t tried, but because Körner’s Folly was not a space designed to be shared on printed pages or through the eyes of others; it was built as a visual, tangible experience unlike any other, and well ahead of its time. “You have to see it to believe it,” Pennington says. It’s safe to assume Körner would be proud to see how his legacy has been preserved today, as it is without a doubt, one of the quirkiest homes in North Carolina.